Jaisalmer is an important destination of the western state of India, Rajasthan. A desert city, it was founded by the Bhatti Rajput chieftain Rawal Jaisal in the year 1156. Jaisalmer could be regarded as the western sentinel of entire India and a place worth visiting to get an idea of the native Rajasthan. 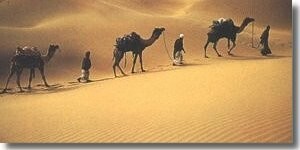 Located at the heart of the great Thar Desert, it offers the visitor an enchanting world of fable, colour, and history. Moreover, the magnificent wood-and stone-carved mansions and buildings display the love and interest Rajputs had for the fine arts. The desert festival held here by the end of the winter season, during the months of January and February, attracts a large number of domestic and foreign tourists. The golden rays of the setting sun, the colourfully adorned locals, the massive forts and mansions, the extremely fascinating craftsmanship, Rajput havelis, all these make Jaisalmer a place of must visit in Rajasthan. Moreover a visit to the Jaisalmer Fort (the second oldest fort in Rajasthan after Chittaur), Patwon ki Haveli, (the grandest haveli of Jaisalmer), Desert Culture centre and museums gives you some glimpse of this small town�s past. The Jain temples meet your religious taste, Salim Singh ki haveli and Nathmal-ki-haveli give you some more idea of the haveli architecture of the town. Besides these, Gadsisar Lake is also an interesting spot that you must visit in this desert city. Apart from many places to visit in Jaisalmer, there some other excursion sites you must not miss out. These sites include many nearby local villages, desert resorts, and places of historical as well as contemporary importance. Khuri, a village that provides you with an earthy feeling of the local Rajasthan, Manvar, a place that would give you once in a lifetime experience of the desert and the famous Pokhran range are some of the sites that needs a mention. You can also go for camel safaris during days and evenings. Ideal for viewing sunsets, these sites will also give you a chance to capture the picturesque sand dunes in your camera. Staying in the desert camps of the above mentioned places with local delicacies served is a heavenly experience. spectacular sight. The characteristic colourful turban tying competitions of the locals, the camel d�cor competitions, tug-of-war along with a prize for the most impressive moustache are some of the many interesting events that will not only thrill you but also make you come here again and again. The life within the citadel gives you a clear picture of the medieval majesty with its magnificent palace, havelis, temples and the skilled artisans and camels all around. Among the havelis made by Jaisalmer/�s wealthy merchants include the Patwon ki Haveli, Salim Singh ki Haveli and Nathmal ki Haveli. The Patwon ki haveli is the grandest mansion in Jaisalmer, having ceiling supported by exquisitely carved pillars. The delicately chiselled balconies and extensive corridors and chambers of this haveli also present an impressive sight. The Desert Culture Centre and Museum is another important place to visit in Jaisalmer. You can see a good collection of historical as well as contemporary objects of interest here giving you a clear insight into past and present of the place. The museum has a good collection of old coins, different kinds of textiles, traditional Rajasthani instruments and some fossils discovered in the desert. The Jaisalmer Fort has three exclusive Jain temples. These three Jain temples are supposedly dedicated to the three Jain tirthankars namely Rishabhdevji, Sambhavanathji and the Ashthapadi. The library located just by these temples holds one of the oldest manuscripts of India. Located at the eastern end of the city, the Salim Singh ki Haveli is an interesting site to visit in Jaisalmer. Built around 300 year ago, this haveli belonged to Salim Singh, the Prime Minister to then Maharaja of Jaisalmer, Maharaja Rawal Gaj Singh. The Salim Singh ki Haveli is characterised by yellow stone that is covered with intricate carvings, elaborate balcony and beautiful blue cupola roof. Nathmal-ki-Haveli is the third of its kind supposedly built in AD 1885. Characterised by intricate architecture and craftsmanship, it belonged to later-day prime minister Nathmal, who gifted it to the Rawal. The haveli has two wings left and right, which were carved by two brothers with splendid miniature paintings. The jharokhas are the speciality of the haveli as they seem to emerge from a book of poetry because of the fine stone carvings. Gadsisar Lake is another important site to visit in Jaisalmer. A scenic rain water lake surrounded by some beautiful shrines makes it a photographer/�s delight. A good number of people visit this lake which also is a favourite outing spot for locals as well. Located at a distance of about 40 kilometres from Jaisalmer, Khuri is another place to visit during your excursion. The village is known for its camel rides, shifting sand dunes that are about 80 metres high and exceptionally beautiful sunset, which could be followed by an exclusive dinner. Many places are available here for eating as well as lodging. You can also experience the desert solitude and beautifully decorated houses of mud and straw. Another place to include in your excursion itinerary is Manvar. The place is famous for its amazing mustard and red chilli fields in the middle of the desert, craftsmen at work, cobblers making jutti, unexplored sand dunes, desert fox, chinkara, peacocks, desert camp with all the facilities, camel safaris and the sunset. A stay in a traditional farmer/�s hut here gives you an glimpse of rural Rajasthan. The Maheshwari havelis, colourful Rajasthani dresses, cenotaphs and temples and the Pokhran Museum are some of the other sites that you can see in Pokhran. Located at a distance of 42 kilometres from Jaisalmer, Sam Sand Dunes is the closest point to witness the total sandy desert. You can also see the patterns and motifs created by the shifting sands and air. Moreover, Sam Sand Dunes also provide you with an unforgettable experience of camel rides and the sunset.